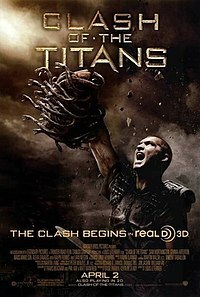 Clash of the Titans is a 2010 fantasy film and remake of the 1981 film of the same name, as noted in the credits. As with the 1981 film, the story is very loosely based upon the Greek myth of Perseus. The film begins with a narration that explains the three Olympians who battled the Titans long ago: Zeus, Poseidon, and Hades. Hades with his creation, the Kraken, provides their means of defeating the Titans. After the Titans' defeat, Zeus created humans and ruled them while Poseidon ruled the sea, but Hades, having been deceived by his brother Zeus was forced to rule the Underworld, learns an alternative way of gaining power from humans different from his brothers receiving theirs from human devotion; through fear. Millennia later, a fisherman named Spyros finds a coffin adrift in the sea, discovering a baby, Perseus, and his dead mother. Spyros decides to raise Perseus as his own. Years later, Perseus and his family are fishing when they witness a group of soldiers from Argos destroying a statue of Zeus as a declaration of war against the gods. Hades appears and commands harpies to massacre the soldiers before he himself destroys Perseus's family's fishing boat. Perseus tries to save his family, but to no avail, the surviving soldiers take Perseus back to Argos. The movie effects were great, but the storyline was a little lacking in development. The ending was a little disappointing. Inoue Mao 'Ice Cream Over Flowers'?